A cat's claws are used to capture prey, for climbing, and in self-defense. Claws are an integral part of a cat's life, but their use can also be a problem for cats' human cohabitants. Declawing, however, is a painful and permanently crippling procedure that should not be practiced. There are effective and humane alternatives to declawing that can reduce or eliminate clawing damage. Cats claw to maintain proper condition of the nails, for fun and exercise, and to mark territory visually as well as with scent. They stretch by digging their claws into something and pulling back against their own clawhold. 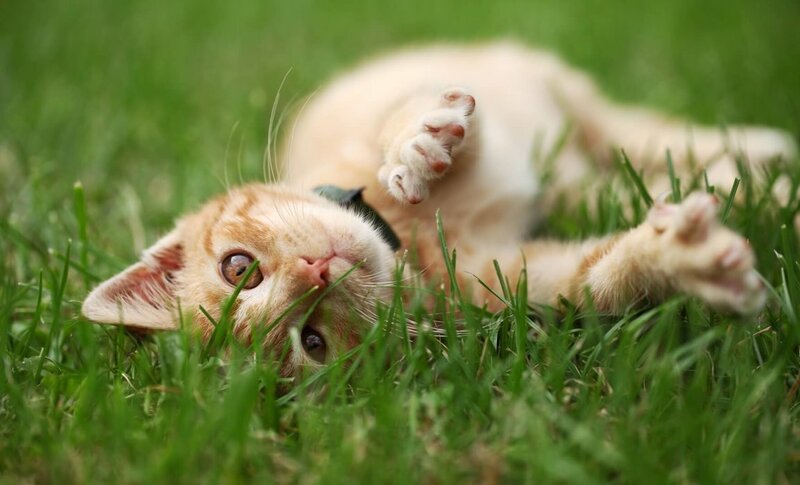 A cat's natural instinct to scratch serves both physical and psychological needs. Before domestication, cats satisfied these needs by clawing tree trunks. Domesticated cats can be trained to satisfy their desire to claw without damaging valuable property. Declawing involves 10 separate, painful amputations. It is a serious surgery, not just a manicure. The British Veterinary Associations calls declawing an "unnecessary mutilation." Indeed, it is illegal in many parts of Europe. Declawing a cat involves general anesthesia and amputation of the last joint of each toe, including the bones, not just the nail. Possible complications of this surgery include reaction to anesthetic, hemorrhage, bone chips which prevent healing, recurrent infections and damage to the radial nerve, pain, and possible abnormal regrowth of the nails. The nails may grow back inside the paw, causing pain but remaining invisible to the eye. Declawed cats need regular X-rays to monitor this problem. Declawing results in a gradual weakening of leg, shoulder, and back muscles, and, because of impaired balance, declawed cats have to relearn to walk much as would a person who lost his or her toes. Without claws, cats are virtually defenseless, and this often leads to neurosis and even skin and bladder problems. Without claws to mark their territory, even house-trained cats will often urinate and defecate outside the litter box in a desperate attempt to ward off intruders. Most animal protection groups, as well as many veterinarians, have spoken out against declawing. Many vets refuse to perform the surgery, calling the operation cruel, and in most cases, unnecessary. There are several misconceptions about declawing. It does not make cats more "mellow." Declawed cats may be morose, reclusive, and withdrawn, or they may be irritable, aggressive and unpredictable. Many people think declawing makes a cat safer around babies, but this is far from true, as the lack of claws turns many cats into biters. Declawed cats feel so insecure, lacking their first line of defense, that they tend to bite more often as a means of self-protection. People who have their cats declawed simply do not understand how important claws are to a cat and do not know how else to deal with the problem. With a little effort and commitment to your cat's welfare, you can eliminate the excuse to declaw your cat and make him or her a better companion as well. Regular nail trimmings. When the cat is relaxed and unafraid, gently press on the toes until the claws extend. Use a pair of animal nail trimmers and cut only the tip of the nail, taking care not to damage the vein or quick. The nail "hook" is what tears up upholstery, so when it is removed, damage is greatly reduced. Buy or build two or more scratching posts. Such posts must be sturdy, tall enough to allow the cat to completely stretch (3 feet or taller), and properly placed. A bark-covered log, a post covered with sisal, or a tightly woven burlap-covered post works well. Soft, fluffy, carpeted scratching posts don't work - they are one of the greatest causes of declawing because cats often don't like the posts, and frustrated human companions resort to surgery. If you use carpet, secure it to the posts with the rough backing on the outside; soft carpeting will not satisfy a cat's need to claw. Place one scratching post where the cat is already clawing, and another close to where he or she normally sleeps (cats like to stretch and scratch when they first wake up). Another option is the cardboard or sisal "scratching box," which lies flat on the floor. These are inexpensive and small enough to scatter around the house, allowing your cat easy access to an "approved" scratching spot at all times. They do wear out fairly quickly, however, and will need to be replaced every few months - otherwise, cats may get frustrated and revert back to using furniture. Give your cat specific instructions as to where to claw and where not to claw. Place your cat on the new scratching post and move his or her paws, or pretend to scratch it yourself. This will scent the posts and encourage exploratory clawing. Make the post a "fun" place to be. Play games with your cat on and around the post and attach hanging strings, balls and/or bouncy wire toys to it. Sprinkle catnip on the post, too. (A once-a-week or so "refresher" application will keep your cat interested.) When kitty uses the post, reinforce this behavior with praise, but be careful not to startle or frighten him or her. When the cat claws furniture, discourage this behavior with a firm voice or other loud noise, but never with physical force. Lukewarm water from a squirt gun directed at the back of the animal is often successful. During the training period, you may need to cover upholstery with plastic or other protection (cats don't like the slippery feel and will quickly learn to stay away). Another option is nail caps for cats. Soft, vinyl nail caps are applied to cats' newly trimmed nails. The nail caps allow cats to scratch naturally, without harming furniture. Each application lasts about four to six weeks.